8.20pm: Official result: BN wins Merlimau by 3,643 votes. Roslan Ahmad receives 5,962 votes, PAS' Yuhaizad Abdullah gets 2,319 votes. 7.15pm: Unofficial result: BN wins by increased majority of more than 3,500 votes. Previous majority was 2,154 votes. BN's Roslan Ahmad tipped to get almost 6,000 votes while PAS' Yuhaizad Abdullah is expect to receive about 2,300 votes. State police chief SAC Datuk Chuah Ghee Lye said no major incidents were reported during polling, with only a few minor cases of over-eager supporters getting carried away when cheering on voters. 5.20pm: Polling ended at 5pm. Votes will be tallied the Platinum Hall, Merlimau Polytechnic, and the result is expected to be announced at 8pm, said an EC spokesman. 4.30pm: EC says 76.87% or 8,181 voters had cast their ballots as at 4pm. 3.45pm: As at 3pm, EC says 72.6% or 7,722 voters had cast their ballots. MCA has refuted Opposition allegations of money being offered to voters by a party councillor. State election machinery director Datuk Koh Nai Kwong said he had checked with Jasin MCA division chief Koh Chin Han after hearing of the claim and found it had nothing to do with the MCA. Koh said the Opposition could claim whatever it wanted. 3pm: With two hours left, voters coming to cast their ballots have slowed down. However, overcast skies with prospect of rain later in the evening could see a rush by last-minute voters. Deputy Prime Minister Tan Sri Muhyiddin Yassin ends his tour of the polling stations in Merlimau and heads for Politeknik Merlimau for a rest. Voting is scheduled to end at 5pm with the results to be announced at Merlimau Politeknik, where the votes will be tallied by 8pm. 2.30pm: EC says 66.8% had voted by 2pm. 1pm: Kota Melaka MP Sim Tong Him filed a police report claiming that a MCA councillor and three others distributed money to voters at a house in front of Permatang Bukit community hall. Each voter was said to have received RM100. Sim added in his report that a newspaper photographer who photographed the alleged incident was forced to delete the photos. 12.35pm: Deputy Prime Minister Tan Sri Muhyiddin Yassin arrives in Merlimau to tour several polling stations and is scheduled to stay on for the announcement of the results at Politeknik Merlimau at 8pm tonight. 12.30pm: Police intervene again to stop a shouting match between PAS and Barisan after PAS supporters protest that a vehicle with Barisan flag drove pass SRJK (C) Merlimau polling centre. 12.20pm: EC says 54% or 5,746 voters had cast their ballots. 11.30am: EC says 43% or 4,571 voters had cast their ballots by 11am. 10.30am: EC says that 3,175 voters or 30% had cast their ballots by 10am. 10.20am: Heavy traffic in Merlimau town, an indication of high voter turnout in early part of polling. 9.25am: EC chairman Tan Ari Abdul Aziz Mohd Yusof said that, as of 9am, the voter turnout was 15% with 1,500 having cast their votes. 9.20am: Police intervene to stop a shouting match between PAS and Barisan supporters near the SRJK(C) Merlimau polling station triggered by both groups cheering voters at the same time standing side-by-side. Police separate the two groups. 9.15am: A minor argument broke out when EC chairman Tan Sri Abdul Aziz Mohd Yusof visited SRJK (C) Jasin Lalang in Ayer Merbau. An opposition observer in the centre accused an EC staff of allegedly telling a woman voter which party to vote. Abdul Aziz said regulations provided for an EC staff to help voters with vision problems by asking them their choice and guiding them in marking the ballot paper. He said all EC staff had sworn to be honest in carrying out their duty and all votes were secret. He said all EC staff and party observers should know the process of election as all of them had been briefed. 9.05am: Pakatan Rakyat and Barisan Nasional vehicles ferrying voters to SRKJ(C) Merlimau in the heart of the old town were stopped by police. Drivers were asked to remove large party flags. The Election Commission stated that such display of party logos were not allowed on vehicles after March 5 midnight. 8.45am: Barisan Nasional candidate Roslan Ahmad arrives with wife to cast his ballot at SK Merlimau 1 in Merlimau Pasir. Most of the early voters are the elderly in polling centres in Merlimau Pasir and centre in the outer part of Merlimau town. 8.40am. PAS candidate Yuhaizad Abdullah accompanies his mother who is casting her vote at SK Chinchin in Jasin Lalang polling centre. 8.20am: Malacca Chief Minister Datuk Seri Mohd Ali Rustam visits his first polling centre at SRJK (C) Jasin Lalang in Air Merbau. "I hope at least 80% of the voters will come out and vote," he said, adding that he also hoped all voters will come out and vote early as weather forecast showed that it might be rain in the afternoon. 8.15am: Supporters from Barisan Nasional and PAS cheer and greet voters. Voters begin streaming into SJRK(C) Merlimau in the heart of Merlimau's old town and SK Merlimau 1 in Merlimau Pasir polling stations. Both are considered crucial centres with over 2,100 registered voters. There's heavy police presence with a police helicopter hovering above Merlimau. 8.00am: Voters are allowed into the seven polling centres to cast their ballots. 7.40am: Some early birds arrive at SRJK (C) Jasin Lalang. 7.15am: Roads in Merlimau are relatively clear but traffic is building. JASIN: The 10,643 voters in the Merlimau will choose their state assemblyman on Sunday. It is a straight contest between Barisan Nasional’s Roslan Ahmad, a local who is the Jasin Umno committee member and PAS’ Yuhaizad Abdullah, also a local boy but not a voter in Merlimau. The Merlimau state seat fell vacant after Mohamad Hidhir, 54, died on Jan 20 following a heart attack. 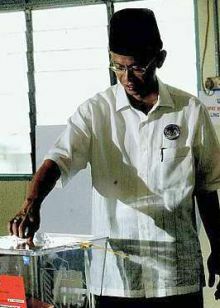 In the 2008 general election, he beat the PAS candidate, Jasme Tompang with a majority of 2,154 votes. The Voter Register contains 10,679 registered voters comprising 10,643 ordinary voters and 36 postal voters. The vote will be tallied at the Dewan Platinum Politeknik Merlimau. Seven schools have been designated as polling centres with a total of 21 voting streams. The Returning Officer is Roslan Eusoff, who is also the Jasin District Officer.